Bayonetta 2 was one of the very best games the Wii U had to offer, a beautifully chaotic action adventure that set a new standard for the genre back in 2014. It was a game that likely slipped under a lot of people’s radars too, being a sequel that no one anticipated for a console few would have chosen let alone owned, funded by a company not exactly known for its adult-focused releases. Strong reception or not, it felt like one of those one-off Nintendo experiments that didn’t find an audience. Of course, Nintendo would catch us all off guard once more at last year’s The Game Awards by announcing a third entry in the series for Switch. Not only that but we’d be given one more chance to experience the second (and original) game on the device too – an offer no one should pass on. Bayonetta 2’s story is about as wacky and over the top as you might expect from a game about shapeshifting witches, demons, angels and shoes with guns on the heel. Picking things up not long after the first game, Bayonetta is out Christmas shopping when a group of angels attack. Joining forces with witch-friend Jeanne, the battle eventually reaches a dramatic shift when the latter has her soul snatched by the depths of Inferno. What then follows is Bayonetta’s journey to reclaim Jeanne’s soul and as you might imagine it happens to be one that’s packed with plenty of dangers along the way. The dialogue can be cheesy as hell with plenty of sexual innuendos laced in for good measure while the camera work borders on perverted panning on the lead character’s crotch on more than one occasion, and while it certainly is entertaining enough to carry you through to the end credits, it’s not the main draw. Combat is where Bayonetta 2 truly excels, the system catering to inexperienced players of third-person actioners but also offering more than enough depth for those that want to master it from every angle. Bayonetta can leap, shoot, slash, kick and punch with ease, weapons equipable to her upper and lower half. Every weapon has its own feel and flow offering a nice range of combos to explore and learn as you progress. Perhaps her most important ability, however, is the art of dodging – every successful side-step taking Bayonetta into slow-motion Witch Time. Nailing the timing not only feels satisfying but is also essential in defeating tougher enemies. Successfully landing attacks also builds up energy that can either be unleashed as an Umbral Climax (a frenzied state where Bayonetta’s attacks are much more powerful) or an over-the-top Torture Attack. The action isn’t just all show; every flamboyant manoeuvre feeling earned and like you are firmly in control even when facing off against a whole gang of enemies. What separates Bayonetta 2 from so many other action games out there is that its combat is slick, constantly rewarding and an absolute pleasure to learn even after numerous playthroughs. Each of the story’s sixteen chapters are broken up into smaller battles or “Verses” each scoring you based on performance. The better your rank the more Halos you earn to spend on the in-game store – everything from new moves to weapons to healing items to costumes. Even the Nintendo-themed outfits are included here unlocked by scanning the appropriate amiibo or buying in store. Between these fights, you’ll also have the chance to explore and pick up useful items tucked away in chests or other environmental objects as well as tackle Muspelheim challenges that pit your skills to the test against enemies under a number of conditions such as never getting hit or never using Witch Time. Bayonetta 2 kicks things off in high gear, its opening chapter alone seeing you fight atop an out of control fighter jet before taking things onto a speeding train and then reaching its climax where you sprout wings and fly through the air taking down a skyscraper-sized dragon demon. Again remember this is just the opening half an hour of the adventure – a series of events that many other games would normally build up to as a grand finale. Bayonetta 2 meanwhile merely laughs at this idea constantly hurling more and more outlandish situations your way one after another – keeping that dial firmly cranked up to eleven and rarely letting up. Even when you start to question if the game can maintain this high level of excitement, you’re suddenly surfing a whirlpool whilst going toe to toe with yet another menacing boss or freefalling down a cathedral amidst another epic battle with a giant sword-wielding angel. Every chapter is a truly dizzying experience grabbing you from its opening moments and never letting go. Unlike its predecessor, Bayonetta 2 also includes a two-player mode titled Tag Climax. Played either online or locally the pair of you will battle it out against waves of enemies as you aim to achieve the higher score. Players take turns choosing Verses to battle through each one offering its own assortment of enemies to best. Wagers can also be made, the winner cashing in and earning bonus Halos, which handily carry over to your single-player total. It’s brilliant, chaotic fun especially with friends, though it is a shame local play requires two systems and two copies of the game. Bayonetta 2 is still a visually striking game not just in terms of graphical oomph but also from a design standpoint too. Environments take you through a number of varied locations; everything from tranquil mountainside towns to the golden-tinted skies of Paradiso and, of course, the hellish Inferno. Likewise, the game’s enemies whether it’s the angels or Infernals are equal measures of ridiculous and creative in their appearance. A common concern for many has been just how well a game like Bayonetta 2 would run on the Switch especially in Handheld mode. Personally, I never picked up on any noticeable drops in framerate playing docked or on the go, the action always fast and buttery smooth even during the most frenzied of situations. 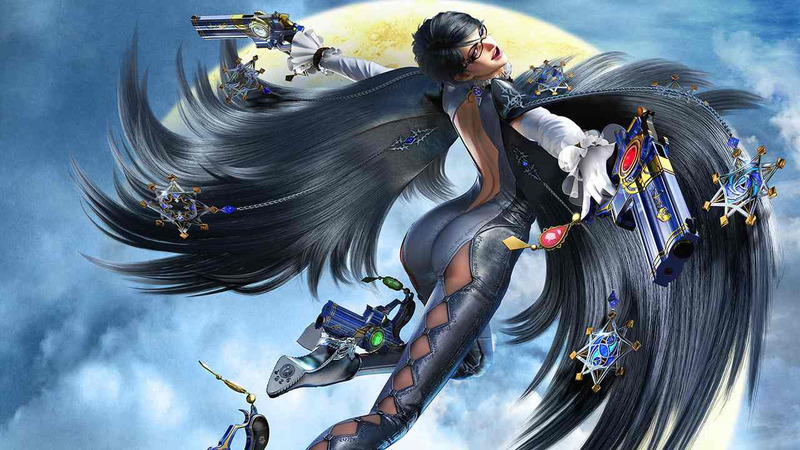 In fact I’d say whatever way you play Bayonetta 2, the experience is a brilliant one. Bayonetta 2 remains a phenomenal thrill-ride from start to finish, each new encounter you face more outrageous and epic than the last. The fact that you can now take this experience anywhere with you easily makes this ultimate version of the game. Sure, it may not dramatically alter the formula laid out in the original, but it’s still a bigger and better package overall and easily one of the best examples of its genre. The wait for Bayonetta 3 just got a whole lot tougher.